Criminal Procedure & Sentencing provides a comprehensive, engaging and up-to-date guide to each step of criminal procedure, from the arrest of the suspect through to trial, sentencing and appeals. Taking a strong practical focus throughout, it covers all aspects of the criminal justice system and sentencing and has been thoroughly revised and updated in the light of changes to the funding of legal aid and widespread changes to the legal system. 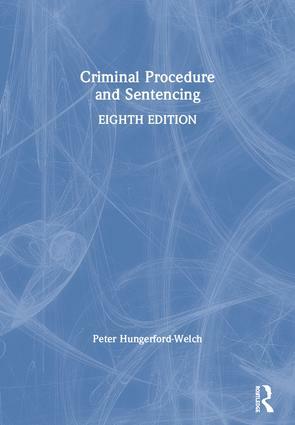 The 8th edition focuses on a thorough explanation of the law and offers a clear and comprehensive account of amendments to the Criminal Procedure Rules and the implications of the Legal Aid, Sentencing and Punishment of Offenders Act 2012 as well as recent case law. The author also considers alternatives to prosecution as well as important developments in sentencing, including the creation of the Sentencing Council by the Coroners and Justice Act 2009 and recent key Court of Appeal decisions affecting sentencing procedure and sentencing principles. The author’s authoritative yet engaging writing style brings the subject to life and helps to explain complex issues in an easy-to-understand way. With a helpful glossary as well as suggestions for further reading at the end of each chapter, this is an ideal text for anyone with an interest in the criminal justice system. The supporting website offers readers access to regular updates to the law but also a comprehensive set of web links and advice on additional reading and research for those seeking to engage in critical evaluation of the criminal justice system.